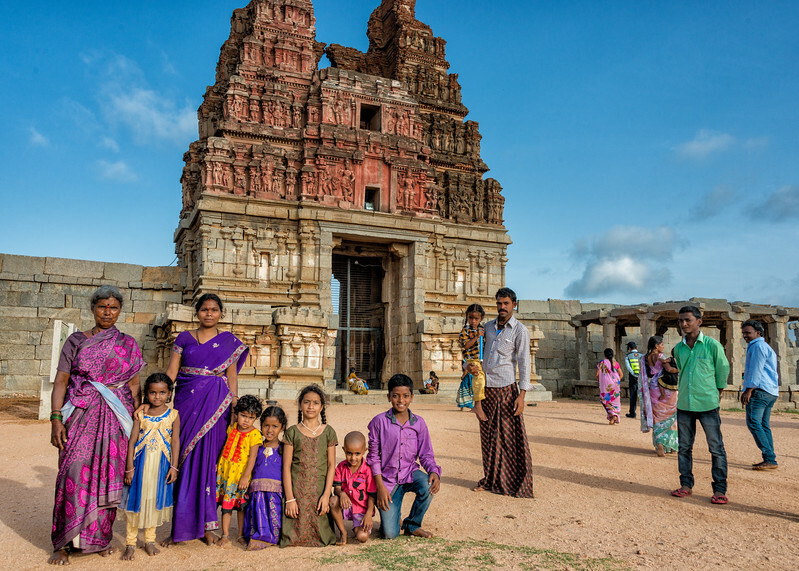 On my recent trip to India I explored the ruins of the capital of the Vijayanagara Empire in Hampi. 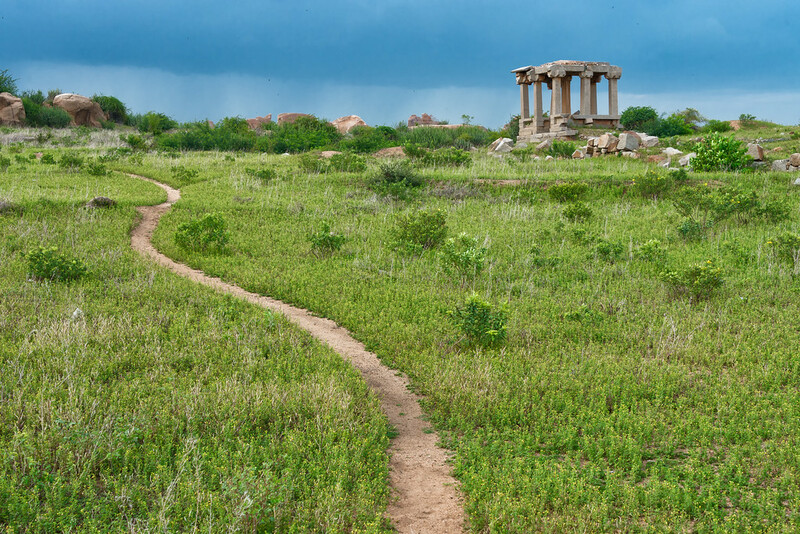 It is just a small village now, but from about 1336-1646 it was a metropolis ruling over most of Southern India. In this post I’ll give you a look behind the scenes at what went in to getting my favorite shots, and talk about what could have been better in some shots I’m not satisfied with. Before shooting I research a place. 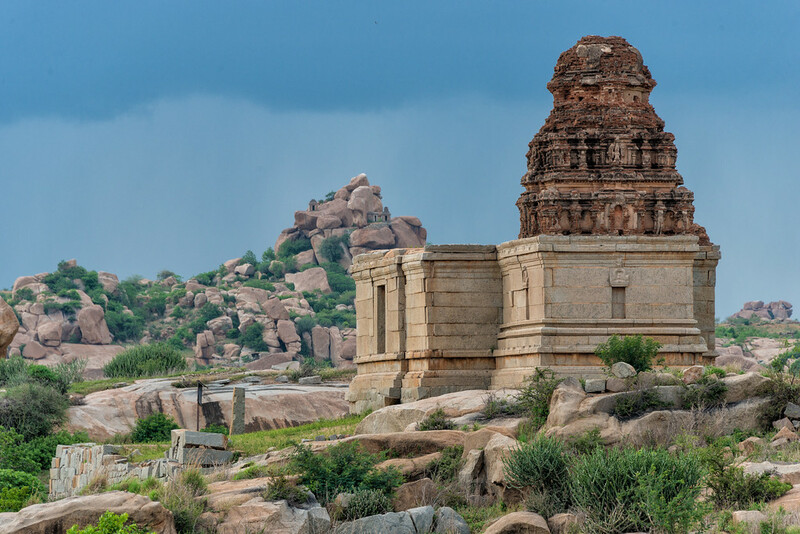 Hampi is a vast stony landscape containing thousands of temples built to encourage and strengthen Hinduism. There are also the remains royal baths, huge bazaars, ornate cisterns, and elephant stables. It’s a large area that is surprisingly easy to walk around and full of surprises. The area has a lot of spiritual significance. Several events from the Ramayana epic are said to have taken place here and there are still many active temples. Anjaneri temple sits high on top a hill and is known as the birthplace of Hanuman, a hero from the Ramayana. 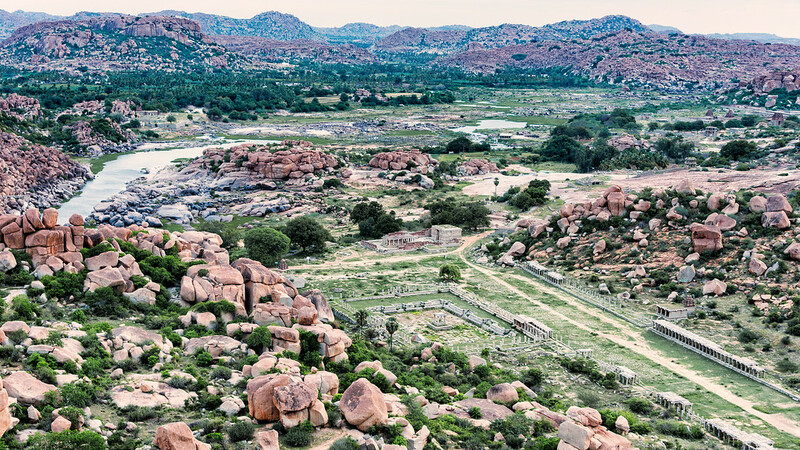 Priests at Anjaneri read the Ramayana epic 24 hours a day over loudspeakers that echo in to the valleys of Hampi. When shooting I tried to capture my feelings about the place; in this case awe and adventure, spirituality, time and history, culture, and craftsmanship. 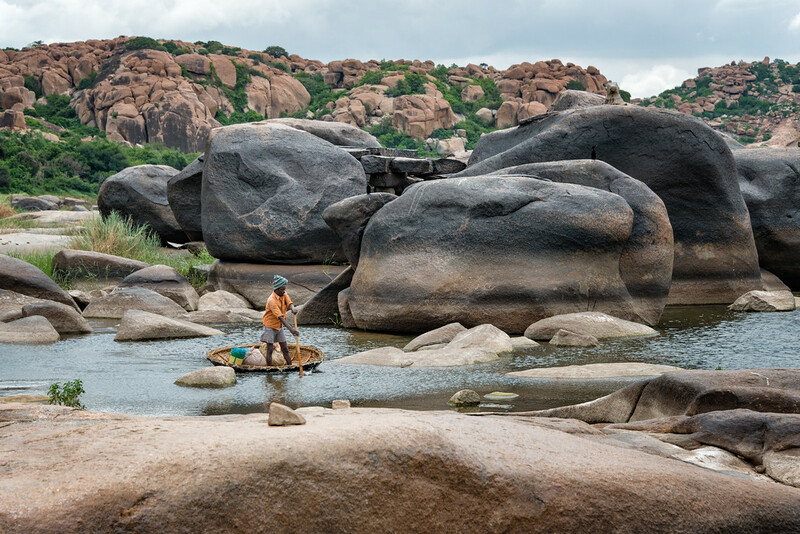 Compositionally, in general terms, Hampi broke down to a few shapes and colors to work with: the large rounded orange boulders, the mass of green foliage, and the strong horizontals and verticals of the grey an faint orange temples. I knew if I found something in another color, a white temple or a purple sari, it would be a great to try to include in a photo. The cover image, where the temple looks like a toy, was accomplished using the Tilt-Shift blur effect in Photoshop. Simply adding this type of blur makes the mind think things look like tiny toys. For best results it helps if the subject is far away, and there is space left in the image to add blur. 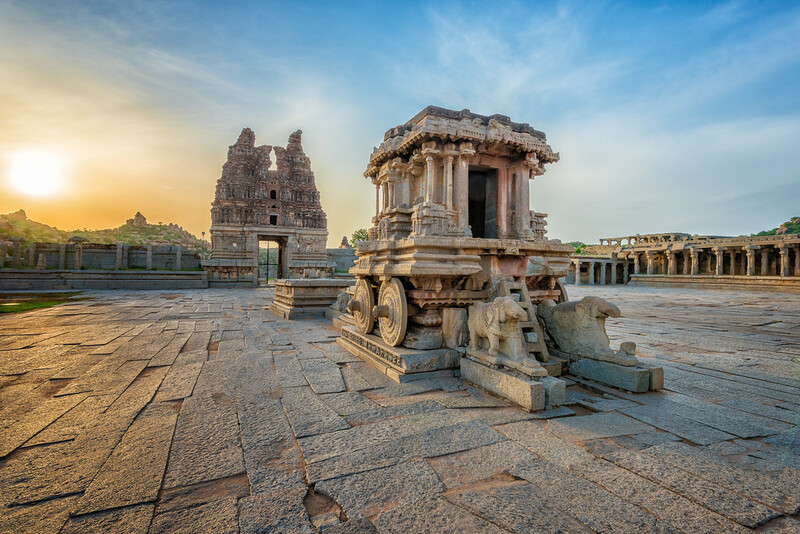 This shot, of the famous stone chariot at Vitthala Temple, was taken in the morning, as soon as the gates opened. I’m always in line at the ticket office before they open since the lighting is usually great at dawn, and it’s the best way to get a place to myself. This image is a five shot bracket, meaning I took five photos using different exposures and then merged them using the HDR tool in Lightroom. I did this because the sun was very bright and the side of the temple facing me was in total shadow. This was the easiest way to make sure all parts of the photo were properly exposed and visible. HDR can look fake if you overdo it, so I try to keep some shadows dark to keep it realistic. This was taken at sunrise from high up on Mathanga Hill. 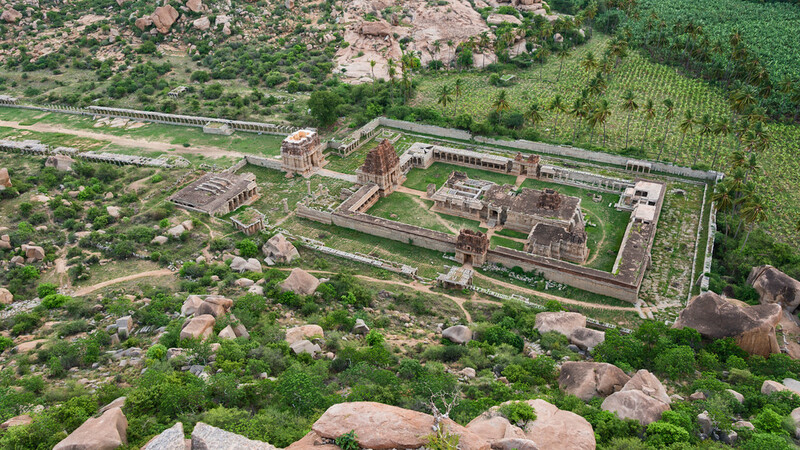 The hill is a great place to get a view of all of Hampi. Perfect for sunrise and sunset. I’m not happy with this photo, it was overcast at sunrise so the colors are washed out. Boosting the contrast and saturation in LR, or using the Dehaze slider, can often fix this type of image, but not this time it just made it look over saturated. That’s how it is with travel photography. You put yourself in the right spot at the right time and hope you get lucky with the weather and people. A lot of times it doesn’t work out and you just have to try again the next day or move on to something else, like shooting close ups. Also with this photo I was trying to show too many things at once, and so there’s no particular spot that grabs the viewer’s attention. Another shot from on Mathanga Hill. It was nice to get above the temple to show its layout. This one worked better because I wasn’t shooting through so much haze, and wasn’t trying to show too much at once. By the way, Anjaneri Hill, across the river is another great place to view the sunset. This holy man was meditating and accepting donations. He was happy to grant a photo for a small donation as well. To help us understand him more, I included a lot of his surroundings like the coin cloth, sandals, cave stones, and a bit of trash.. If I’d just done a head shot or close up we’d know a lot less about him and Hampi. I liked how the small curvy path makes it feel like we are on an adventure, off the usual way. 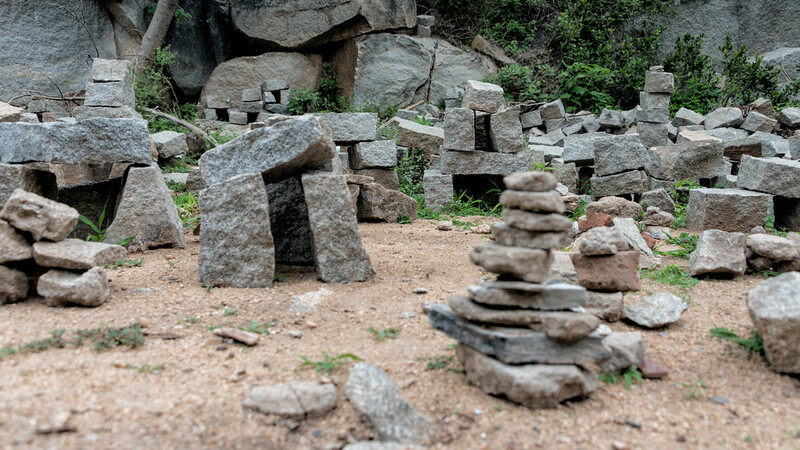 I also like that it is a limited set of colors and textures, grass and boulders, that makes the temple, with its grey vertical lines, stand out more strongly. There’s a risk of the path leading the viewer’s eye out of the frame, but the strong compositional weight of the temple balances that out. I like this one because it shows temples in both the foreground and background, and because the hill shape mirrors the temple shape. But I think the hill and temple are too close together in this photo. I should have taken a few steps to the left to put some space between them. This was a lucky moment. I was trying to cross the river and this boat went by. As soon as I saw him I forgot everything and chased down the river. My thought was to not let him get ahead of me and end up shooting him from behind. I was also trying to put a nice background behind him and catch him while the paddle was moving, since people in this kind of shot are more interesting, and make for better compositions, when they are doing something. There are a lot of interesting places on the other side of the river. There’s no bridge close to the monuments so you can either rock hop across the river, take a small ferry, or hire a car for the long drive to the other side. Since the places are really spread out, I recommend a car. If you have a dream of owning a house, build a small one near the temple, and your dreams may come true. If you have a big family you might want to build a two story house like the one in the back. What was important here was to find an angle that wasn’t too cluttered and showed the shape of the structures. I shot it low to the ground to make them feel more like houses. Shooting down at them while standing wouldn’t have shown the structure as well. To give the true feel of a place it’s important to show the details, and not just big wide shots. I like how this shot conveys a sense of culture and time. 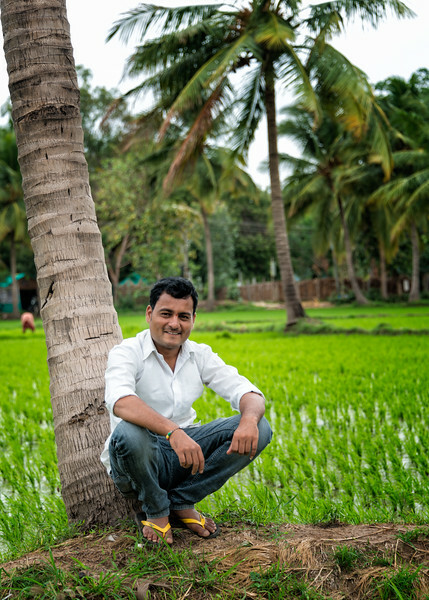 I met so many friendly people in India. This family didn’t speak any English, but they saw I had a big camera and gestured for me to shoot them as they all lined up. How easy is that? In India I didn’t have to do anything but be there and people start posting for me! I love India and all the colors and personalities. But this photo feels too posed for me. It doesn’t say enough about them or Hampi. I should have taken the time to be friendly with them, get comfortable, and catch them being themselves. 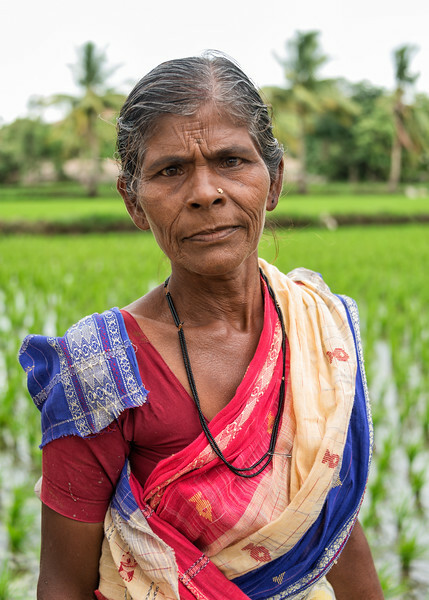 Knowing that people in India were really friendly to me and my camera, I had no problem walking up to a group of people working in a rice field and ask to take portraits. Most of the people were in to it, some were not. I kept an eye out for people who seem the most excited and charismatic, the ones I made a connection with, and built on that. They get a kick out of seeing the photos, and never seemed to want a copy. Afterwards it’s nice to thank people like this with candy or a small gift. 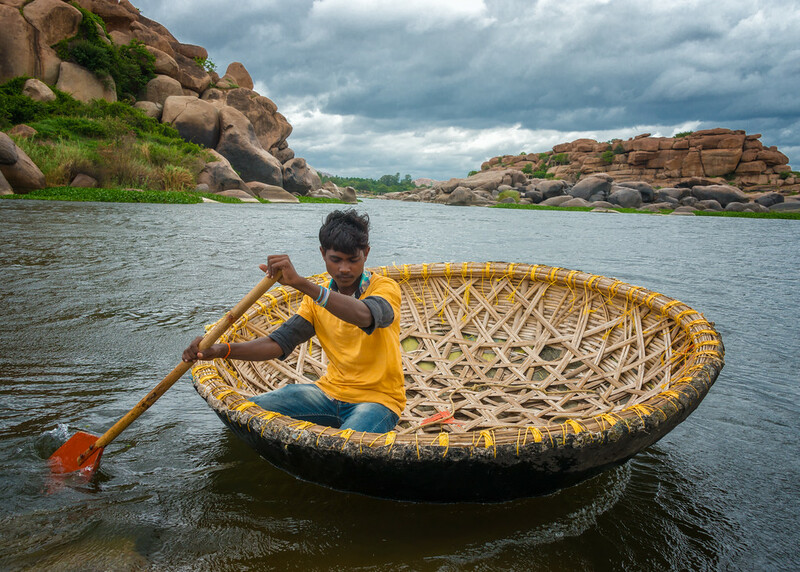 These boats, known as coracles, were offering rides up river. I thought about taking a ride, but if I did I couldn’t shoot the boat. So instead I booked a tour but stayed on shore and shot him in the boat. I made sure to pick the guide with the brightest shirt so he would be the focus point of the photo. After that it was a matter of coaxing him to a spot with a good background. I’ve got mixed feelings about hiring guides. Too many times they want to show me where to go and what to photograph. They may know what’s important or famous, but they don’t know what I’m trying to do as a photographer. Often I walk away from my confused and protesting guide to shoot something that looks pointless to him but is an interesting composition or adds to my story of the place. At Hampi I found a great guide, in a Tuk Tuk, along the road looking for clients. He understood when I explained that I was looking at things in my own special way and he gave me the space to run off and do what I wanted. He grew up in the area and knew it very well and was able to take me to interesting or out of the way spots and tell me great stories about the place that I would have totally missed out on otherwise. And when I ran out of things to shoot he always had ideas on new places to drive me. Thank you Ambarish. These shots were all taken on a Nikon D800 with either a 14-24 lens or a 28-300. To avoid grain and blur I used a tripod when there wasn’t enough light or things were far away. All images were finished in Lightroom and Photoshop, usually by adding a little contrast, sharpness, and saturation – because I like things to seem a bit dramatic. I hope you found this interesting. I always find it useful to look over what I shot and learn from what I did. Thanks for reading! 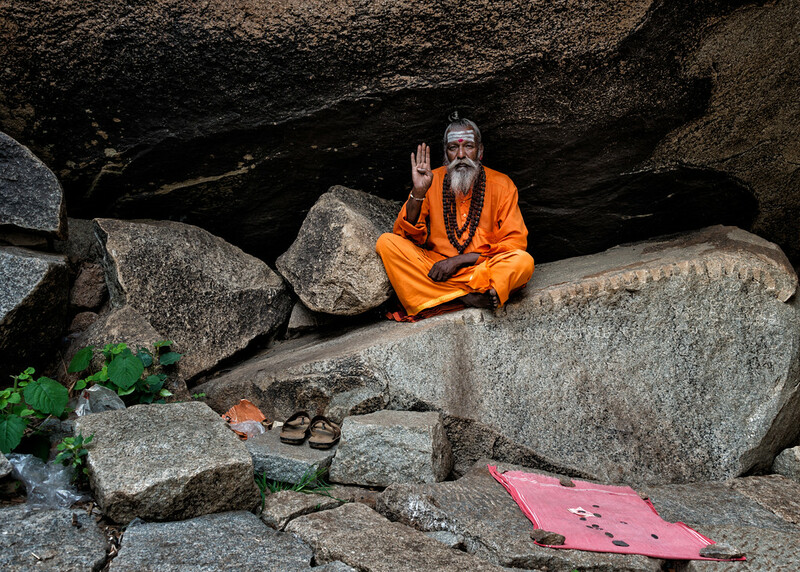 You can see more photos from India on my website. beautiful capture….. enjoyed reading the same….. Excellent, Ron, I learned a lot by reading this post.